It's Friday, and the start of our official Recipe Review series! I hate a lot of banter at the beginning of recipe posts, so I'm going to keep that to a minimum. Please read through this post first, then visit the links at the bottom for the original recipe. Maybe not quite as vibrant as the original recipe, but it was delicious!! What really drew me to this recipe was the amazing variety of colors, tastes and textures. Plus, since my husband is an ovo-lacto-pescatarian (no meat, but eggs, dairy and seafood are okay), I prefer recipes where the protein can be cooked separately, and added for just those who want it. If you cook Asian-inspired food often, invest in sesame oil, coconut aminos (or tamari, which I used), sriracha, and rice vinegar. These are flexible, flavorful ingredients that can be used in many stir-fry recipes, and of course, this one. I DID have to buy fresh ginger and cilantro but the rest of the ingredients are part of my normal shopping list. Color! What incredible variety between red, green and purple. It was a joy to put this together. Texture - not too crispy, not too mushy. It's like a party in your mouth! Great as a veggie entree, too. Serve the chicken on the side like I did for those who want it. Lots of chopping/veggie prep. *Consider a bagged cabbage/coleslaw mix in place of the cabbage & carrots in the recipe (this will reduce the prep time and carb count of the recipe). 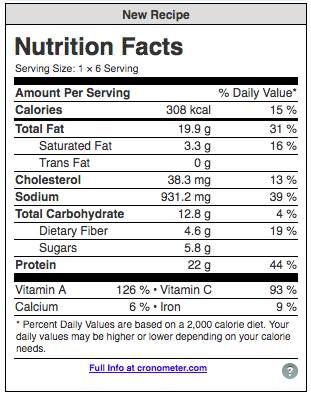 Recipes where protein and carbs are mixed can be difficult to calculate serving sizes. I suggest keeping the chicken on the side as I did to measure appropriate servings. The prep and cooking time were not accurate for me. I had the chicken pre-cooked which shortened the cooking time but I spent longer prepping than anticipated. I ended up with 20 minutes prep and under 10 minutes total cooking time. It's easy to overcook the zoodles, making the recipe watery. 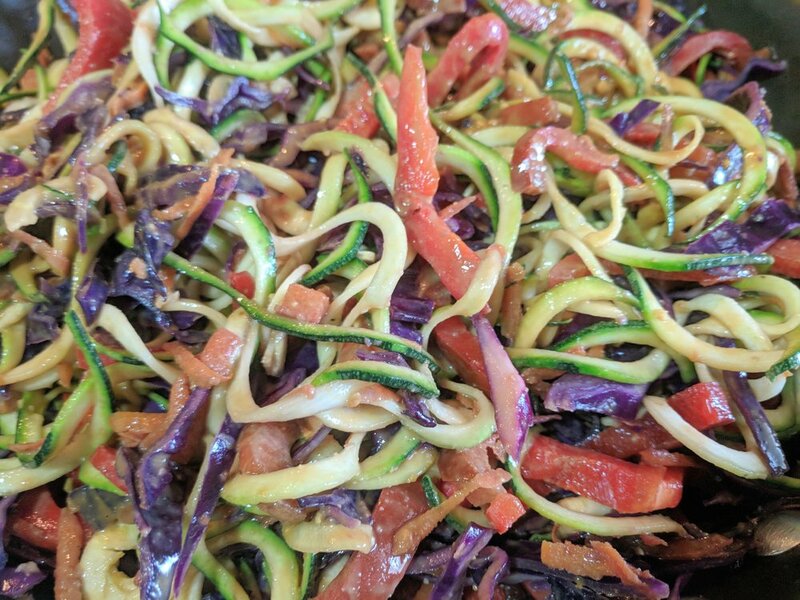 *Add the zoodles for a minute at the very end of cooking - or microwave the zoodles separately to desired tenderness and add to the other vegetables. It's a very large recipe. For our family of 4, eating this as an entree, we still had leftovers. 3-out-of-4 of us went back for a second helping. I loved the chicken and peanut sauce together (like chicken satay), and thought the fresh green onions & cilantro really made the recipe come together. If you have an aversion to cilantro, leave this out. Next time, I'll really watch the cooking times and the thickness of the zoodles. Mine were on the thin side, like a linguini, making them cook even faster. I recommend thicker zoodles to hold up better. 3 out of 4 thumbs up! In all fairness, I knew my youngest daughter wouldn't like this because she doesn't like peanut butter in the other Asian-inspired dishes I've made. She gave it a good shot and tried a few bites, then opted for the chicken breast and and a simple salad. I will definitely make this one again. I want to play with the cooking times to make sure the veggies don't overcook. 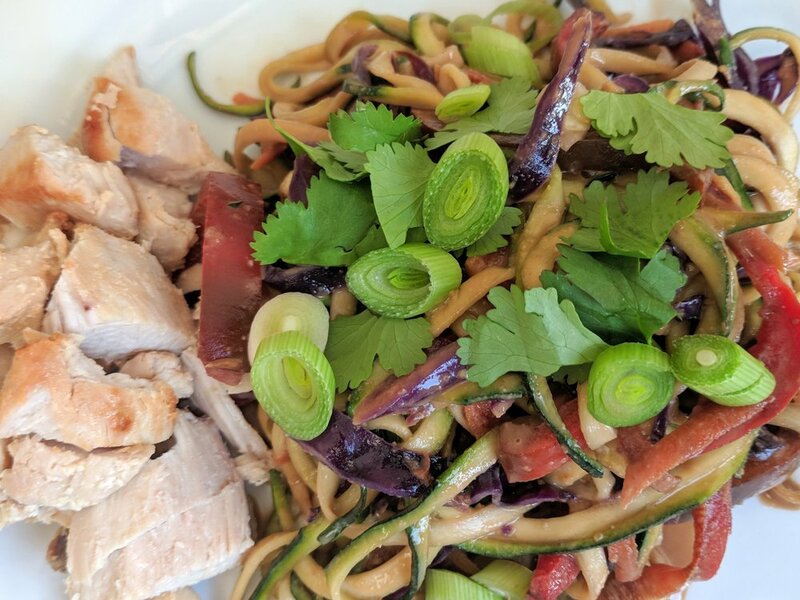 Click here to see the Peanut Chicken Zucchini Noodle recipe from Low Carb Yum. Consider supporting these amazing low carb recipe bloggers that I'll be featuring through liking their pages on Facebook, buying their cookbooks/ebooks and following their blogs. I'm not paid in any way to promote these recipes/products/authors, I just want to support the people who make low carb easier and more fun for us by creating wonderful recipes! 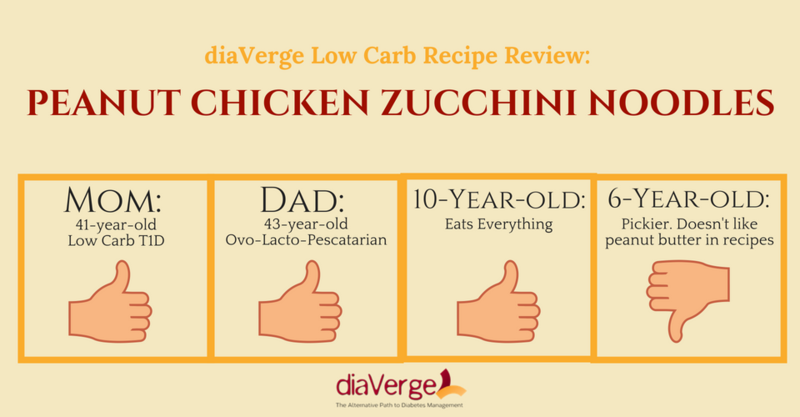 Enter your name & email address to receive news, recipes & updates from diaVerge Low Carb Diabetes. We respect your privacy. By signing up here, you agree to receive twice-monthly email updates from diaVerge. You may unsubscribe at any time. Please check your inbox for an email confirmation that you should receive shortly. You will not receive updates until you have confirmed your subscription. Thank you for joining diaVerge Diabetes!